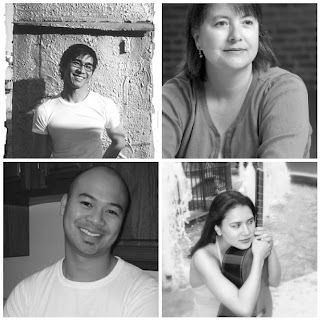 Who: Oliver de la Paz, Joseph O. Legaspi, Mari L'Esperance, and Theresa Calpotura (guitar). Theresa Calpotura has won a number of awards from associations such as the National Foundation for the Advancement of the Arts and the American String Teachers Association, and has received scholarships from the Oberlin Conservatory and the Yale School of Music. Ms. Calpotura studied with the renown guitar pedagogue Scott Cmiel of the San Francisco Conservatory of Music, and graduated from the Oberlin Conservatory where she studied with guitarist Stephen Aron. She then continued at the Yale School of Music with guitarist and composer Benjamin Verdery. Ms. Calpotura has given concerts and masterclasses in the US and in the Philippines. Oliver de la Paz is the author of three books of poetry: Names Above Houses and Furious Lullaby (Southern Illinois University Press), and Requiem for the Orchard, a winner of the 2009 University of Akron Poetry Prize which will be available in the Spring of 2010. He is the co-chair of the advisory board for Kundiman, and he is a recipient of grants from the Artist Trust of Washington and the New York Foundation for the Arts. He teaches at Western Washington University. Joseph O. Legaspi is the author of Imago (CavanKerry Press), winner of a 2008 Global Filipino Literary Award. Born in the Philippines, he currently resides in Manhattan and works at Columbia University. A graduate of New York University’s Creative Writing Program, recent works appeared in Callaloo, North American Review, Poets & Writers, New York Theater Review, Crab Orchard Review, Gay & Lesbian Review and the anthology Language for a New Century (W.W. Norton). A recipient of a poetry fellowship from the New York Foundation for the Arts and an Urban Artists grant, he co-founded Kundiman (www.kundiman.org), a non-profit organization serving Asian American poets. Visit him at www.josepholegaspi.com. Mari L’Esperance’s first full-length collection The Darkened Temple was awarded the 2007 Prairie Schooner Book Prize in Poetry and published by University of Nebraska Press in September 2008. An earlier collection Begin Here was awarded the 1999 Sarasota Poetry Theatre Press Chapbook Prize and published in 2000. L’Esperance’s work has appeared in several literary journals, including the Beloit Poetry Journal, Many Mountains Moving, Poetry Kanto, and Salamander; in Writing the Life Poetic: An Invitation to Read and Write Poetry by Sage Cohen (Writer’s Digest Books); and is forthcoming in the anthology When the Muse Calls: Poems for the Creative Life, edited by Kathryn Ridall. 10/17/2009: Writing Workshop with Luis Francia. 10 am @ the Bayanihan Community Center (register). Reading with Neela Banerjee, Luis Francia, Alejandro Murguía, and Jean Vengua. 2 pm @ the Bayanihan Community Center. 11/07/2009: Justin Chin, Sarah Gambito, Maiana Minahal, and Marianne Villanueva. 2 pm @ the Bayanihan Community Center.